A reproduction statues. Light in colour. "Pandora" : 1170mm (46") tall. A reproduction statue of a "Buhhda"
A reproduction statue of "Angelina". A reproduction statue of a "Cherub on a ball and plinth" The statue shown, comes in two pieces, the Cherub and Ball sit onto the plinth. A reproduction statue of the : "Venus de Milo " (slight second). A reproduction statue of the : "Flute Cherub" (slight second). 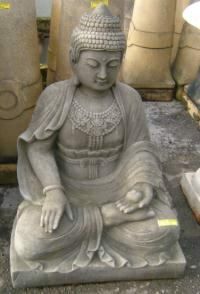 Description: A large, very heavy reproduction "Buddha" statue. Description : A reproduction "Golfer" statue . 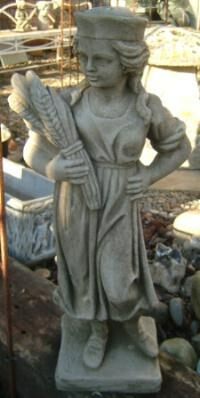 Description : A reproduction "Chasity" statue . Description: A reproduction "Kneeling Lady" statue. Description : A reproduction "Shy Girl" statue . Description: A reclaimed,weathered "Haddonstone" Putti . 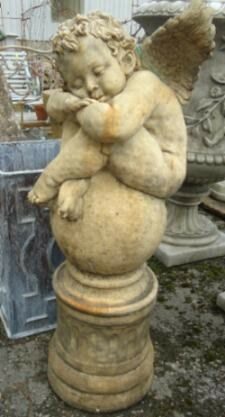 Description : A reclaimed weathered "Haddonstone" Putti. 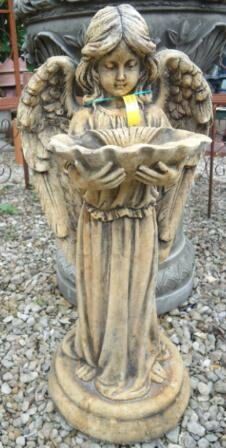 Description: Reproduction statue "Classical Lady" carrying basket of flowers. 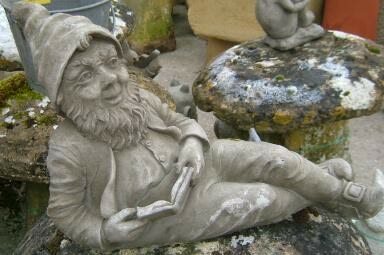 Description: A reproduction statue of a gnome. Description: A basket of fruit. Description: A pair of reproduction pineapples. Description: A single, reproduction statue of a standing lion. Description: A reproduction satue of a sitting hound.